The Runtime Parameters dialog provides test parameters for your program. You can access the Runtime Dialog by selecting Debug -> Runtime Parameters option from the menu bar. The main use of the Runtime Parameters is to provide test command-line values for your program. Normally, to enter command line values for a program you would have to generate a Stand Alone version of the Program and then run the program from a DOS prompt. This can be time consuming during the edit/compile/test process. To solve this problem and speed up development, the Runtime Dialog lets you enter a set of command-line arguments that will be sent to the program while it is being compiled and run in the IDE. To send custom command-line arguments to your program, enter one or more text strings in the Command Line Arguments list shown above. Next, enable the Use These Arguments check box. 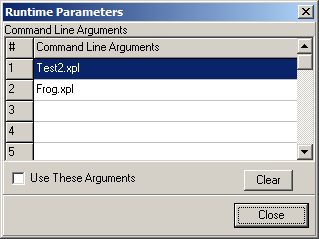 The set of command-line arguments will be sent to the program, each one as a separate element. In EXPL, command-line arguments are accessed using the CommandLine Intrinsic.